I wanted to share a few Christmas cards I made using the Joyride collection from Collage Press. 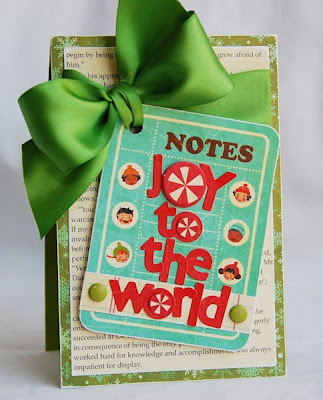 For my first card, I used a journaling card as a tag and dressed it up with alphabet stickers for the sentiment. A very quick and easy card. Perfect for the busy holidays. 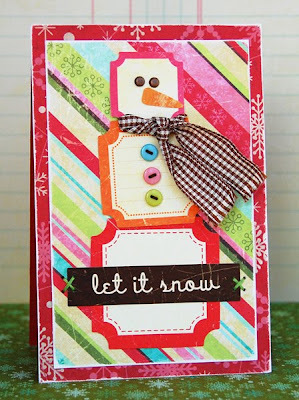 For my second card, I focused on the fun die-cut shaped paper. It is actually from the Sweet Shoppe collection, but it works so well with the Joyride collection. 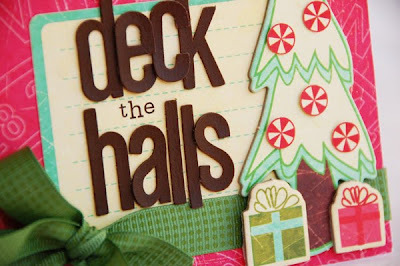 Then I just added some chipboard and journaling cuts, and I cut out a few peppermint shapes from the patterned paper to adorn the tree. Thought I would stop by and share my Pink Paislee projects with you for this month. For this first project is a Christmas one. 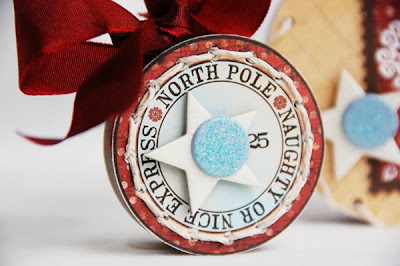 I decorated some old ribbon spool to make Christmas ornaments. Not a new concept, but a first time one for me. I used the Mistletoe & Co. collection, and I just love the way they turned out. This next project I did for the Pink Paislee blog. My theme this month was Friday Feelings. For this, I decided to put the focus on my journaling with stitching. I used my sewing machine and underlined my journaling, then added a few zigzag stitches for fun. I used the Cupid collection and Expressions Alphabets. I am in love with the colors of this collection. There are 5 more days left to the Holiday Sale. I realized in rushing to get the new stamps finished, put up on the website and running the sale that I never did a giveaway. Shame on me! So, this is what I came up with. Let's spread the word about the last few days of the sale. Sunghee made up this adorable blinkie a few days ago. 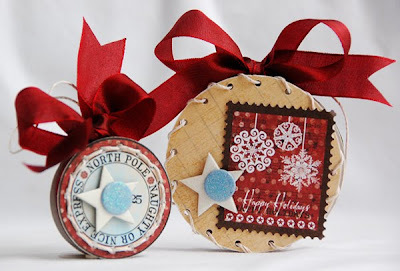 25% off all stamps till December 15th!! Put the blinkie up on your blog, website, in your signature or wherever else it can be posted on the internet. 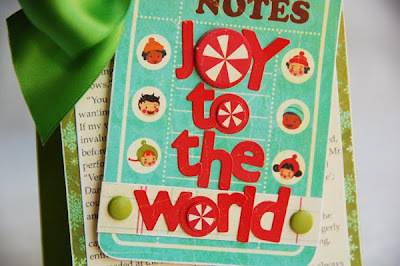 Tell your readers that the sale is 25% off all stamps till December 15th. Encourage them to also post the blinkie and sale information. The more the merrier, right? In this case, the more sale blinkies posted the more stamps to be given away. Then come back here and leave a comment with a link to where you have posted the blinkie. I will then randomly pick one name for every fifteen posts (since the sale ends on 15th and there are 15 days till Christmas). 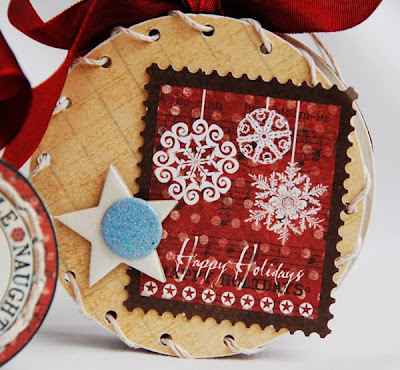 The winning names will receive a little holiday stamp prize package which will include one of the new logo stamps. You have until Sunday December 13th at midnight to leave a comment on this post with your sale blinkie link. Good luck! so little time. I bet many of you are feeling the same way. 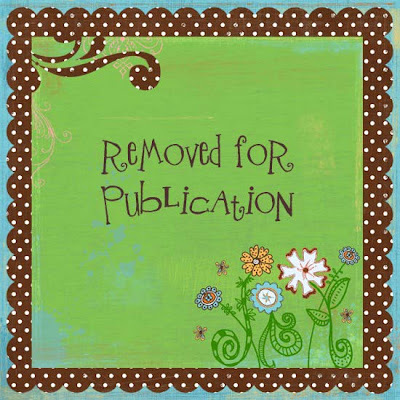 I thought I would log on real quick and share a few cards I made for Collage Press using the new Joyride collection. I had a lot of fun using the journaling cuts for both cards.